Pink Lemon Twist: The Fluffy Pink Squid of Doom is Eating Ramius! OK, that's not actually happening at all. Ramius is fine. This is an "action shot" of my lap while I was working on the Cherry Blossom shawl and Ramius was sitting in my lap, under the shawl. Didn't mean to frighten you. You may knit, Mommy, but just don't tickle de ears! Cute photo. The knitting looks as ethereal as cotton candy. 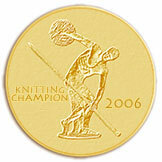 This is precisely how I knit, Melanie!! 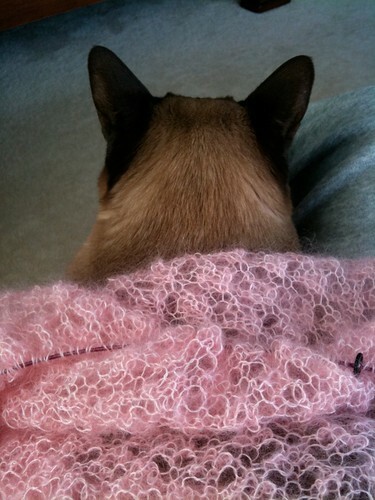 My sweet kittie sacks out on my knees, thereby permitting yards of knitted lace to drape around and adorn her. Congrats on being almost done. Yay! Whew!!! He's NOT being eaten alive.